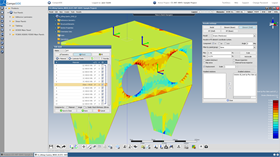 CompoSIDE Ltd provides an engineering simulation and data management platform for composite design and analysis software. CompoSIDE Ltd, which provides an engineering simulation and data management platform for composite design and analysis software, says that unlimited calculations are now offered as standard subscription. This story is reprinted from material from CompoSIDE, with editorial changes made by Materials Today. The views expressed in this article do not necessarily represent those of Elsevier. Tees Valley Unlimited has commissioned a report on potential demand for composites in the UK.